As social media wine and food pairing posts continue to be successful, we increasingly field requests to share recipes and/or how to adapted the ones we are using. So that said, TalesoftheCork will occasionally post behind the scene looks, sharing mistakes, messes, and triumphs as we plate and pair food. With the potatoes roasted separately and the garlic cream sauce made, I combined them to the herbed seared chicken breasts in a baking pan. As with most, meal preparation and execution takes some planning before placing any ingredients on the counter. While many serve garlic chicken and may be a household classic, we thought to share a base recipe from DamnDelicious.net, tweaked to fit our taste profile. This brings me to my wife’s first suggestion to any budding home chef: Try a recipe as listed before you engage with recipe creation. We included an altered Damn Delicious.net ingredient list at the bottom of the article for a lovely, yummy, easy to create one-dish dinner. Enjoy a single-pan Parmesan garlic cream chicken dinner with roasted potatoes and spinach this week. The key to any meal is prepare a grocery list over the weekend make sure your staples are stocked. 1. Coat both sides of the skinless chicken breasts with olive oil. Rub cracked pepper, Italian and rotisserie seasonings on the chicken then sprinkle Kosher salt to taste. However, our preferences are WalterSalt.com, Tangerine Wheat salt because of their subtle citrus and umami, savory flavors. We think the key to delicious meat preparation is bringing it to room temperature and seasoning at least 30 minutes before cooking. Let set. 2. Preheat oven to 400 degrees F. If you have the ability to use a convection oven, this will spend up the process, reducing cooking times. 3. Pour a couple of ounces of olive oil in and heat in a large skillet. Then melt a couple of tablespoons of butter over medium heat. Be careful not to burn the butter. You might choose to taste your wine or beverage during dinner preparation. This week we tried a Sonoma County Maldonado Chardonnay. 4. Sear the meat on both sides until flesh is golden brown. Do not over cook, about 2-3 minutes. Set aside on separate dish. 5. I like to roast my Yukon gold potatoes before cooking them with the chicken mixture. Chop them into quarters (or smaller chunks) and mixed them in olive oil and cracked pepper. Put in a open roaring dish and place in the 400 degree F oven while preparing rest of meal (15-20 minutes). This will ensure they will bake all the way through but also have that roasted aroma and flavor we love. 6. In a sauce pan, melt a couple of tablespoons of butter and a splash of olive oil then add chopped garlic over medium heat. Continuously stir to avoid burning garlic for 1-2 minutes until fragrant. Overcooked garlic will become bitter tasting. Whisk 2-3 tablespoons of flour into the butter and garlic, staring until lightly brown, about a minute. 7. We like adding a splash of dry white wine at this point (our preference is a light oaked Chardonnay) at this point to further infuse the mixture with flavor. Slowly add the chicken broth, fresh thyme and a basil leaf. Cook and whisk the mixture thoroughly until consistent–another minute or two. 8. Slowly incorporate the half and half and sprinkle in the grated Parmesan cheese a small handful at a time. Keep stirring. The heat should remain medium yet hot enough to melt the cheese to create a creamy consistency. This will take a couple of minutes. Adjust Parmesan to thicken or adjust density. Add more salt and pepper as per personal taste. TIP: Add some extra half and half if mixture is too thick. If cream sauce is too thin, add a teaspoon of flour to a splash of cool milk and shake in a separate container to dissolve. Add to hot cheesy cream. 9. Place seared chicken breast on bottom of greased/prepared baking pan. Remove roasting potatoes from oven and place on and around seasoned chicken breasts. Pour prepared garlic and Parmesan creme sauce over the ingredients. As a one-dish meal, the garlic Parmesan sauce carries the dish. Add the spinach and parsley in the last minute of baking just to wilt the greens. 10. Place in middle of hot oven and roast until chicken is completely cooked through, reaching internal temperature of 165 F. Use a thermometer to check temp. This should take about 25-30 minutes or quicker depending on whether you are using a conventional or convection oven. 11. During bake time, chop the spinach and parsley to add near the end of the cooking time. As temperatures in the chicken reach the safe zone, pull dish from oven and use a large serving dish to spoon the spinach into the hot dish and garlic sauce to cook for the last five minutes. Most vegetables break down and lose their nutrients if they are overcooked. Remember, after washing spinach, it can be eaten raw so just cook it enough to wilt it in the garlic sauce. 12. Garnish dish with parsley and serve immediately. We paired our Parmesan garlic cream chicken with a Maldonado Vineyards 2010 Parr Vineyard Chardonnay. The Sonoma County wine was fabulous with the dish. This cool Chardonnay has green apple and citrus notes but amazing depth. It also has ripe stone fruit, vanilla and toasty nuts but its minerality comes through with a light creamy texture. This is a big wine and is rich and can handle a wide variety of foods. Look for their 2012 vintage online. Maldonado Vineyards also has other Napa Valley Chardonnay examples. Chardonnays are a good choice for creamy, mild and buttery foods and pair well with this roasted herbed chicken in a garlic cream sauce. However a wide variety of Chardonnays are a good choice for this one-dish meal. Look for Chardonnays that are lightly oaked, with ripe fruit, and hearty. They pair well with simple dishes that are mild, creamy, silky and buttery. Foods that are grilled or roasted do well as risottos and cream-enhanced soups or pastas. Also meaty fish like halibut, cod and rich tasting shellfish. In 50-60 minutes, you can serve a hot and healthy one-dish meal. Thanks again to the original chicken and potatoes recipe on Damn Delicious. Be sure to read TalesoftheCork’s previous blog post, “Lodi Wine Country: Boutique winery innovation.” And if winemakers, wineries or restaurants are interested in a TalesoftheCork wine and/or food review on the blog, Instagram, Twitter and/or Facebook, please send us a request via email: talesofthecork@gmail.com or use DM on social media. TalesoftheCork also offers social media seminars for businesses. When I first met winemaker Cynthia Cosco a couple of years ago in San Francisco, I immediately felt she was someone I wanted to follow. Her affiliation with DogPatch Wine Works in San Francisco, an urban wine group, helped cement my affiliation. While I live in the Central Valley, I can still get out to visit Sonoma County wineries a few times a year. Passaggio winemaker and owner Cynthia Cosco met me at her Sonoma Square tasting room a few months ago. While I sometimes feel a loss for not accomplishing my dreams yet, I am inspired by those who have risked much for a dream in pursuit of their passion. Yesterday, as I sat in my pool, sipping the last of my 2014 Passaggio Wine Tempranillo Rose, my thoughts turned to Cynthia. Cynthia’s story and Passaggio Wines are now a well-known commodity to Sonoma winophiles (Video). After a 15-year career in law enforcement, she sought to reconnect to her Italian family tradition of winemakers and pursued the passion in 2004 at BevMo of all places. By 2007 she was making her own wine while working for CrushPad in Napa and later in Sonoma while becoming their lead winemaker in 2011. She introduced her brand in 2012 and now has a tasting room in the Sonoma Square. Cynthia’s participation in community events, promotion of other winemakers via twitter chats and her encouraging demeanor is infectious. And while I continue to reinvent myself, a transition from full-time journalism teacher to social media and reputation management specialist to a passion for food and wine, I am inspired by people like Cynthia who dream and day-by-day step out, risk and pursue a a vision. While I finished my 2014 Passaggio Tempranillo Rose, their tasting room as both the 2015 version as well as one created from Merlot. Both are excellent pool and food wines. So while I sip Passaggio 2014 Tempranillo, the wild strawberry, watermelon, raspberry and dry savory notes linger. It’s crisp flavors are great alone or with a poolside food bite. But that is old news. The 2015 version is for sale with slightly different flavors as vineyard, weather and winemaker all adjust character, combined with past experiences and focus. Heck, I understand the 2015 Passaggio Merlot Rose is delicious. While I missed the #WineStudio Sonoma Rosé Revolution Twitter chat on June 7 while I was in Italy, I know I missed good conversation. I need to stop into her tasting room and try a bottle and reconnect with Cynthia. And if you get to Sonoma Square before I do, please tell her and tasting room manager Frank, I said hi. Passaggio Wines is open every day of the week. They can be found in the Sonoma Square. Their tasting room is at 25 East Napa St, Suite C, Sonoma, CA 95476. Phone: (707) 934-8941 and email: info@passaggiowines.com. They are open Monday-Thursday, noon- 6 p.m., Friday-Sunday, 11 a.m. – 6 p.m. 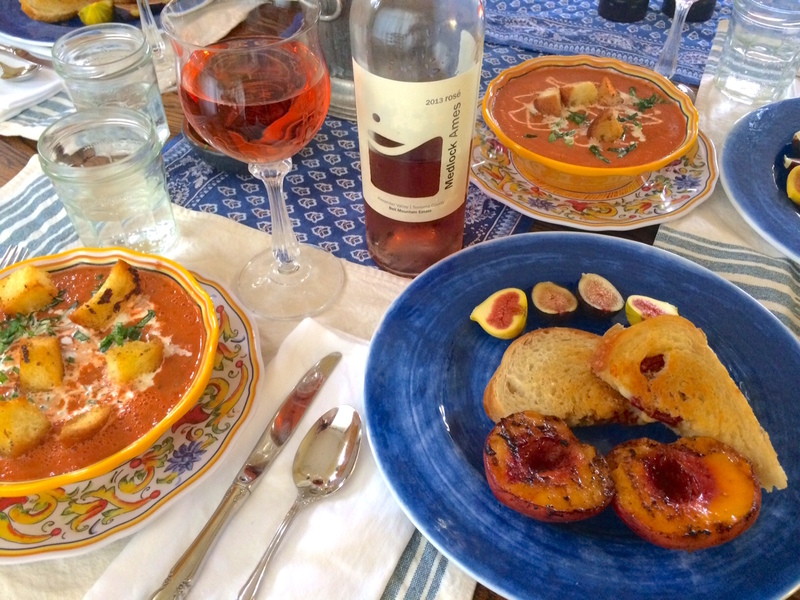 If you missed my last post, check out the August 16, 2015, post, Beat the heat with cool Gazpacho, Medlock Ames Rosé. After 10 months of darkness, TalesoftheCork is ready to resume regular postings. Please check back and repost. With temperatures well over 100F this week, we are creating simpler meals to feed us but promote cool plates and quieter ovens. Our evening began away from the table for a quick sip of a Medlock Ames 2013 Alexander Valley Bell Mountain Estate #Rose, Sonoma County. I love taking a moment to relax for a few minutes with a sip of Rose before dinner by the pool. Medlock Ames is an estate fine wine producer located in Alexander Valley, Sonoma County, California. Started in 1998 by friends Chris James and Ames Morison, their boutique winery and ranch produces high quality, artisan wines that are organically farmed and the methods include 100% solar-powered and advocate progressive, creative farming. They are tucked away at the edge of Alexander Valley atop Bell Mountain. You can find the Medlock Ames tasting room in a century-old landmark Alexander Valley Store & Bar via 3487 Alexander Valley Road, Healdsburg, CA 95448. Call them at 707.431.8845 or use email:info@medlockames.com. They are also on Twitter and Instagram. While this is not their best effort, I am trying the Medlock Ames 2013 a year after release. However, the Medlock Ames 2013 Rose has yummy aromas of strawberries, watermelon and spice. It’s crisp, dry and has a slight tangy finish. I know their 2014 is even better so make sure to check in with their latest offering. Our first entrée was summer soup: homemade chilled Gazpacho. We shopped the local farmers market for fresh heirloom and plum tomatoes, a red pepper, cucumber, two celery sticks, a red onion, basil, and a jalapeño. Later we added red wine vinegar and balsamic vinegar, cracked salt and pepper (all to taste). One of the keys to a create cold tomato-based soup is fresh ingredients and to add and subtract based on your palate. Chop into larger pieces but let the blender do the work as you blend the ingredients to a smooth consistency. While dinners don’t need fancy plates, we purchased these bright melamine summer-colored dinners on clearance at Sur la Table. They seem to add a ‘pop’ to a TalesoftheCork meal. Place blended mixture in a bowl and refrigerate for at least two hours before service. In the meantime, we created a garlic cream to drizzle over top before eating. We added 1/3 cup (100cc) of whipping or heavy cream, mince and swirled in three chopped cloves of garlic. Place in a cooler for an hour, bring to room temperature and pass the cream through a sieve before dripping on the surface of the Gazpacho. For a crunch while chilling with the Gazpacho, we also made herbed-garlic croutons–day old sourdough, baguette or Batard are best. Chop into good size pieces, coat in good olive oil and minced garlic, add a sprinkle of Italian herbs, salt and pepper and toast in a 350F oven for 15 minutes. Wait until just before service before adding the garnished basil, cream garlic drizzle and herbed-garlic croutons. This adds interest and adds flare to the presentation as well as to the overall taste. For the second entree, some prep is also needed but simple in nature. Two hours before, Geena prepared a tomato confit. This entails boiling whole plum tomatoes for 20 seconds then removing their skins. Then she halved the tomatoes, removed the seeds and drizzled them in a pan with olive oil, sliced garlic, salt and peeper and roasted them at 250F for two hours. The 3-cheese grilled sourdough sandwich includes Havarti, Gruyere, and an aged white cheddar. 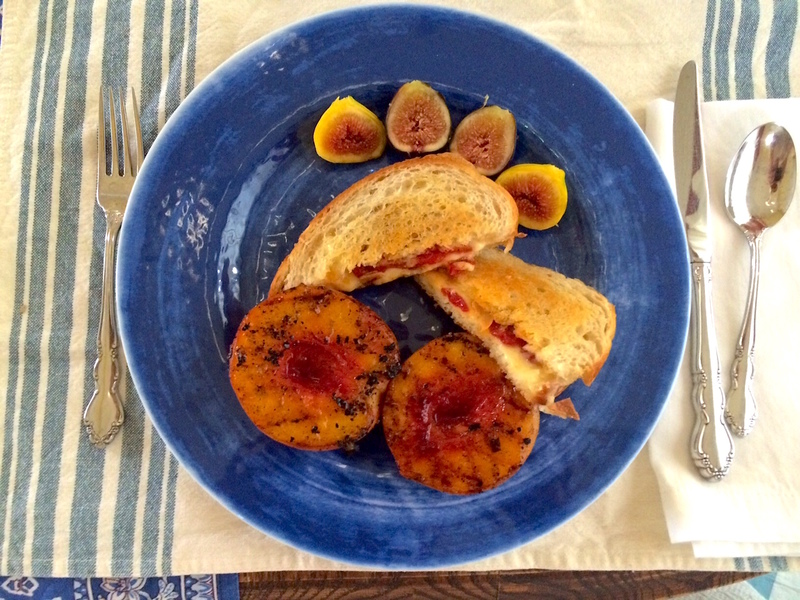 Grilled peaches are wonderful summer snacks, fresh fruit option with fresh figs and/or a dessert. The tomato confit was then added to already melted three-cheese grilled sourdough open sandwiches. We used Havarti, Gruyere, and aged white cheddar. Add a little butter to the outside of the bread to give the closed sandwich its golden color and crisp characteristics. Meanwhile I fired up the BBQ with some wood and briquettes to grill our fruit (dessert if I could be patient). After cutting the peaches in half, I brushed them will olive oil, Grand Marnier, and a dab of butter, grilling them on each side off the flame for three to five minutes a side depending on how hot your grill is. I finished with a sprinkle of raw sugar on each half, grilling to caramelize and get the classic grill marks. We finished the plate with halved Mission and Tiger figs–raw–and added a glass of sparkling Pellegrino. A TalesoftheCork summer dinner to keep cool but still feel like you ate well. If you missed my last post, check out the August 4, 2015, post, Grilled salmon, peaches and Cardwell Hill Pinot. Be sure to return check out my Twitter @TalesoftheCork and on my Instagram (@Talesofthecork) daily postings. Please take the time to find me on Facebook as well at Facebook/TalesoftheCork. I also would covet those who would suggest a wine, restaurant, chef or hotel to visit. Feel free to contact me through social media or via email at talesofthecork@gmail.com. I spent three days in Sonoma County in July and, on a tip from David Scheidt, was privileged to meet Jim Rickards at his Alexander Valley tasting room in Cloverdale, CA. My premise for the trip was to taste first-rate California Rosés and J. Rickards Winery made the list. 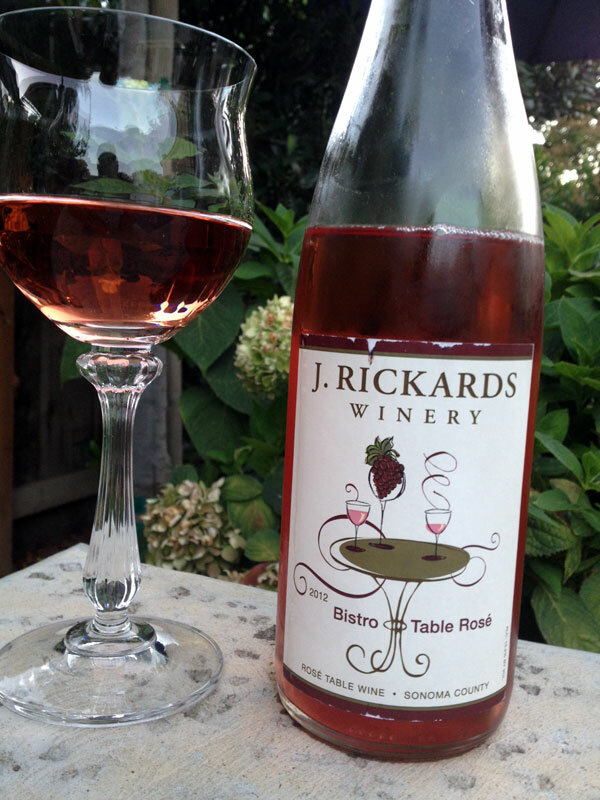 The J. Rickards 2012 Bistro Table Rosé is perfect for the European palate, with fragrant rose petal, strawberry, watermelon in a crisp, dry finish. With the summer in full swing, I wanted to begin with J. Rickards aperitif-style Rosé; it was dry and rosy-pink. Perfect for the European palate, the slightly fruity wine is a sure “patio pounder.” The 2012 Bistro Table Rosé opens with fragrant rose petal and strawberry on the nose with a burst of watermelon and crisp, dry finish. The complex taste lingers and is versatile with food or by itself at poolside. Try this blend of 60% Aleatico, 40% Syrah (100 cases, $20). 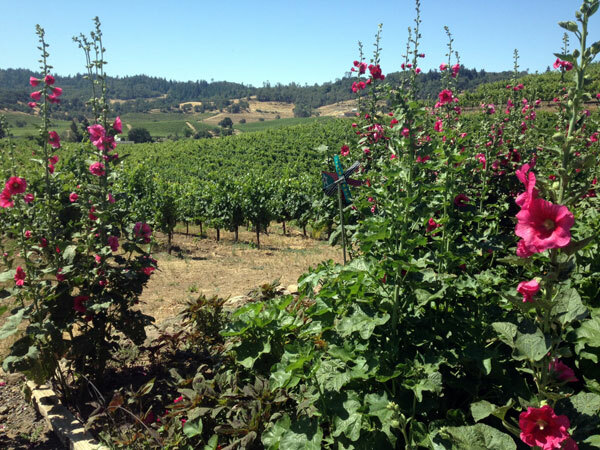 Just off of California Highway 101 north of Geyserville near Silver Oak Cellars in Sonoma County, the family-run operation of both wine grape farming and wine production is owned and operated by Jim and Eliza Rickards. They planted the vineyards starting in 1976, augmenting the original 1908 Old Vine Zinfandel block planted using horse technology. When Jim left the military in 1969 with his military cut and large mustache, his dream was to work and own a winery. Hand-crafting small lot wines since 1991, Jim Rickards goal is to showcase the diverse soils and micro-climates of his vineyards. He has pioneered environmentally sensitive vineyard practices and been a proponent of sustainable farming techniques. As their property had been in disuse and very little left from the original land owners, except the 105-year-old vines of Old Zinfandel planted by the Brignole family, the Rickards had years of development ahead of them. In fact, the dream was so strong, they passionately recreated the early 20th century winery. He was told there was no water on the 60-acre ranch and that the best land use would be a rock quarry. Today, there are two wells and two large ponds providing water for all irrigation. Jim revived the original Zinfandel vineyard, adding new Zinfandel vines and later added Cabernet and Syrah, grafting much of their new stock. Born out of the encouragement of friends who have enjoyed the small lots of hand-crafted wine, the couple has been making wine since 1991. As Jim began to share his passion for his wines, it became evident he was gifting me a personal history of his love for hand-crafted wines. His story includes pioneering environmentally sensitive vineyard practices and a long-time proponent of sustainable farming techniques. He spoke of losing 20 acres of vines in the late 80s-early 90s and replacing them with new disease resistant root stock. Jim’s tale includes nearly losing the farm to now growing 150 tons of grapes per year on his 45 acres. Land stewardship is extremely important to Jim. The planting and mulching of wild flowers and grasses and the planned introduction of environmentally friendly insects all help to create pesticides free vineyards for 20 years. He builds bird boxes which have attracted songbirds like the Western Bluebird and Tree Swallow. 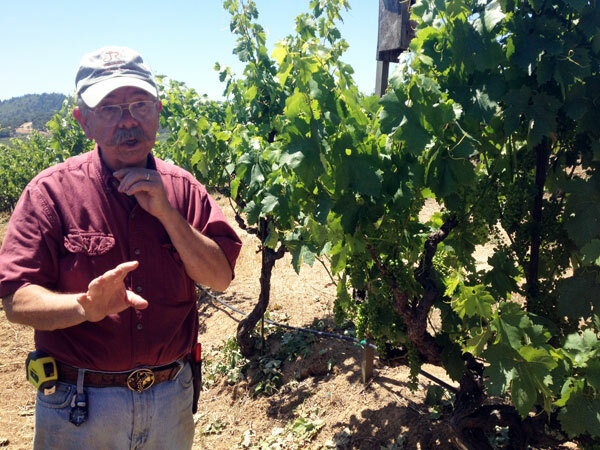 His use of manures and composts help add minerals and beneficial bacteria to the vineyards. From collecting rain water to the building materials his home and tasting room are made of, Jim has created a winery which is sustainable and suitable for the land he farms. While J. Rickards is Jim and Eliza’s dream, they raised two daughters and a son who do not carry their parents’ passion into their adulthood. This Sonoma County winery remains under the zeal and spirited direction of Jim who almost always addresses his visitors with “Welcome to my house.” Jim’s warm, inviting personality soon wins over those who visit the tasting room to try some of his 15 varieties of wine. He truly has lived out the phrase, “Friends are the family you get to choose yourself,” welcoming folks from all over into his circle. The Old Vine Zinfandel, Estate, planted in 1908 from the Brignole Vineyard, is flush with Blackberry and plum. The Ancestor Selections Zinfandel, Estate, is a prime example of the Alexander Valley with black cherry, raspberry and pepper. While I tasted through much of his wines, I do want to recommend visitors taste side by side the Ancestor Selections Zinfandel, Estate and the Old Vine Zinfandel, Estate. I loved the elegance of the 2009 Ancestor Zin. The ripe black cherry, raspberry and spicy pepper were balanced and smooth (658 cases, $24). Yet I am old school. I preferred the rich, old-world full-bodied “field blend” of the 2010 Zinfandel, Old Vine. The boysenberry, plum and gingerbread were gorgeous. The mocha and juiciness lingered. Jim blended 80% Zinfandel, 10% Petit Syrah, 5% Carignane, 4% Mataro and 1% of Alicante Bouschet (515 cases, $25). This is a must-buy for those not yet familiar with J. Rickards. I appreciated Jim sharing how he hand-crafts his wines while pioneering environmentally sensitive vineyard practices and sustainable farming techniques. Yet despite all the accolades his wines have earned, Jim is passionate, not pretentious, allowing the wine to speak for itself. 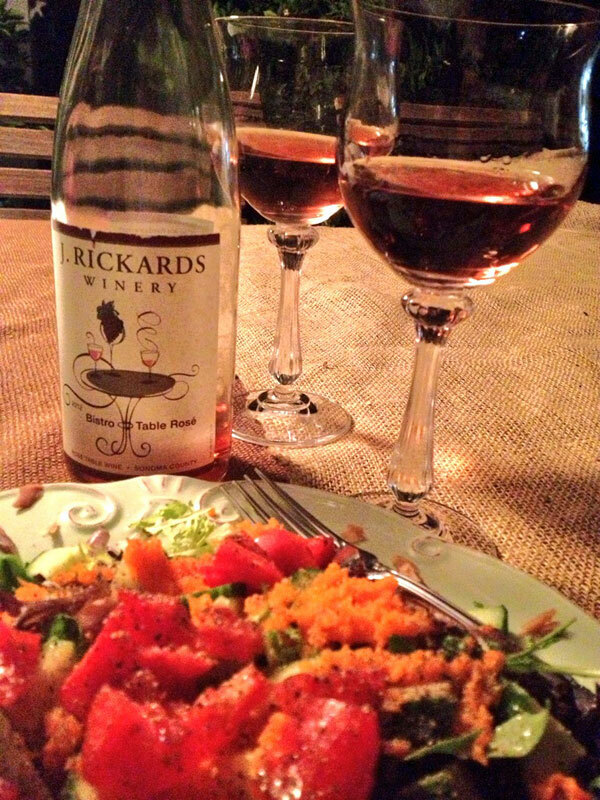 J. Rickards dry Bistro Table Rosé with smoked salmon salad. This is a full-bodied wine that is great for almost any patio meal. Before this gets too long, I also want to recommend J. Rickards 2010 Cabernet Sauvignon, Five Sisters Blend. It is fruit forward but made in the Bordeax-style. He smiles and calls it an $80 Cab in a $34 dress (322 cases). Finally, the 2012 Sauvignon Blanc, Croft Vineyard is a Gold Medal winner at the 2013 North Coast Wine Challenge. I could smell and taste grapefruit, white peach, floral aromas, leading to fig and melon. This is great for summer lighter fare as well as richer foods like roasted chicken (1150 cases, $19). With over 450 Sonoma County wineries, including J. Rickards, be sure to visit as there is sure to be wine to fit all tastes, pocketbook and pairing options. Wine Oh TV’s Monique Soltani as she interviews Jim Rickards. 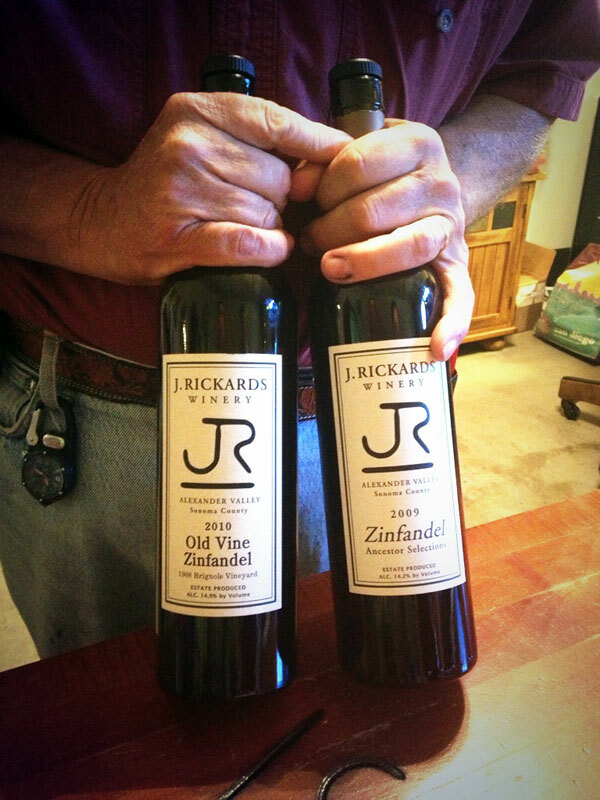 For more information on J. Rickards Winery, visit them online at http://www.jrwinery.com or call: 707.758.3441. They can also be reached via email: jim@jrwinery.com or on Facebook at http://www.facebook.com/J.Rickards.Winery. J. Rickards Winery is on 24505 Chianti Road, Cloverdale, CA, 95425. If you missed my last post, check out the South African Mulderbosch Rosé delivers superb summer value.